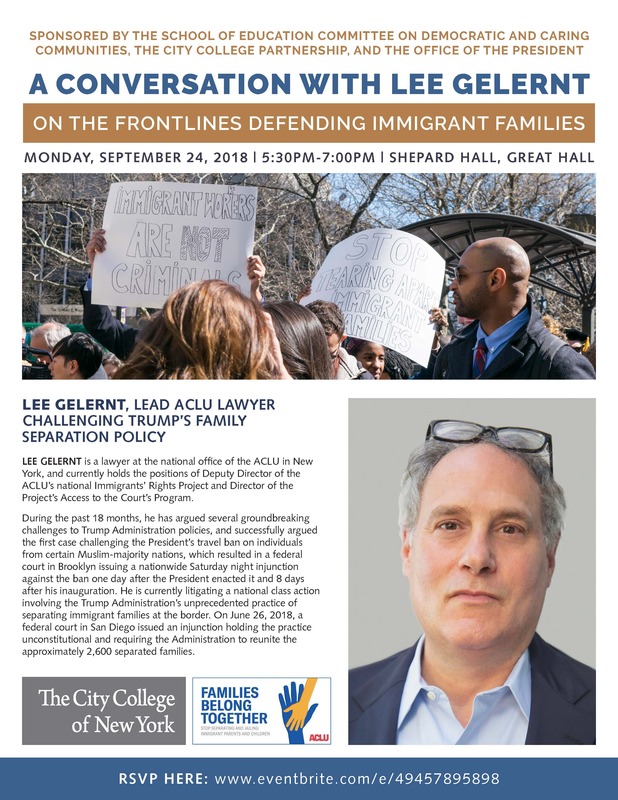 LEE GELERNT, LEAD ACLU LAWYER CHALLENGING TRUMP’S FAMILY SEPARATION POLICY, will speak about the resistance to the Trump Administration's immigration policies and what educators and citizens can do to help. LEE GELERNT is a lawyer at the national office of the ACLU in New York, and currently holds the positions of Deputy Director of the ACLU’s national Immigrants’ Rights Project and Director of the Project’s Access to the Court’s Program. During the past 18 months, he has argued several groundbreaking challenges to Trump Administration policies, and successfully argued the first case challenging the President’s travel ban on individuals from certain Muslim-majority nations, which resulted in a federal court in Brooklyn issuing a nationwide Saturday night injunction against the ban one day after the President enacted it and 8 days after his inauguration. He is currently litigating a national class action involving the Trump Administration’s unprecedented practice of separating immigrant families at the border. On June 26, 2018, a federal court in San Diego issued an injunction holding the practice unconstitutional and requiring the Administration to reunite the approximately 2,600 separated families.